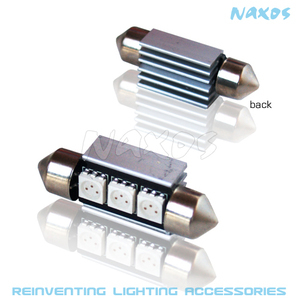 Saika Enterprise : NX-FESX36-5-3 - FES36 CANBUS 5050 3 SMD Twin Set of LED Bulbs (4 Colors Avail.) by NAXOS [NX-FESX36-5-3] - Contact for Price! NX-FESX36-5-3 - FES36 CANBUS 5050 3 SMD Twin Set of LED Bulbs (4 Colors Avail.) by NAXOS Contact for Price!